Large swaths of the American public want Donald J. Trump to be their president – maybe even a majority, according to an analysis from Nate Silver’s FiveThirtyEight in late July. Many people – Democrats and Republicans alike – find this shocking. Trump made his name as the “You’re fired” guy. He has never held political office, has arguably failed to generate concrete or realistic policy proposals, regularly changes his positions on issues and consistently gets the facts wrong. This stands in sharp contrast to Hillary Clinton, who has served as secretary of state, senator from New York and first lady of the United States. In his endorsement of her, Barack Obama described Clinton as the most qualified presidential nominee in U.S. history. Presumably experience with, and knowledge of, the system and issues are qualities that make for a good president – so why is this race even close? Research, including new work from our Human Cooperation Laboratory at Yale, suggests Trump may be successful precisely because of his hotheadedness and lack of carefully thought-out proposals. Being seen as uncalculating can make people trust you. What’s more, the desire to appear trustworthy motivated participants to act without too much forethought. Our research didn’t focus on perceptions of politicians, but rather looked at behavior in a more abstract context. We conducted a series of experiments involving economic decisions between anonymous strangers on the internet. Our goal was to create a scenario that would capture the classic trade-off between self-interest and helping others. This is something that comes up in a lot in politics, but also in all sorts of social interactions, such as in our relationships with friends, coworkers and lovers. Our experiments occur in two stages, with participants assigned to specific roles. In the Helping Game stage, “Helpers” are given some money and have the opportunity to give some of it away to benefit another participant. The second participant is a total stranger who is assigned to the “Recipient” role, and not given any money. Helpers know that helping the Recipient out will come at a cost – sacrificing a predetermined, but undisclosed, amount of money. We then give Helpers a choice. They can decide whether to help the Recipient without “looking” at the cost (i.e., without knowing how much money they’ll be giving away). Or, they can choose to find out how much money they’ll be giving away and only then decide whether to help. Next, in the Trust Game stage, Helpers engage in a new interaction with a third participant. This person is called the “Truster.” The Truster learns about how the Helper behaved in the first interaction, and then uses it to decide how much the Helper can be trusted. To measure trust, we give the Truster 30 cents. He then chooses how much to keep and how much to “invest” in the Helper. Any money he invests gets tripled and given to the Helper. The Helper then chooses how to divide the proceeds of the investment. Under these rules, investing is productive, because it makes the pot grow larger. But investing pays off for the Truster only if the Helper is trustworthy, and returns enough money to make the Truster a profit. For example, if the Truster invests all 30 cents, that amount is tripled and the Helper gets 90 cents. If the Helper is trustworthy and returns half, they both end up with 45 cents: more than the Truster started with. However, the Helper may decide to keep all 90 cents and return nothing. In this case, the Truster ends up with zero and is worse off than when he started. So the Truster bases his decision of how much to invest in the Helper on how trustworthy he thinks the she will be in the face of a temptation to be selfish – that is, how much he trusts her. We found that Helpers who agree to help the Recipient without “looking” at the cost are trusted more by Trusters. Moreover, they really are more trustworthy. These “uncalculating Helpers” actually return more money to Trusters in the face of the temptation to keep it all for themselves. We also found that Helpers are motivated by concerns about their reputation. 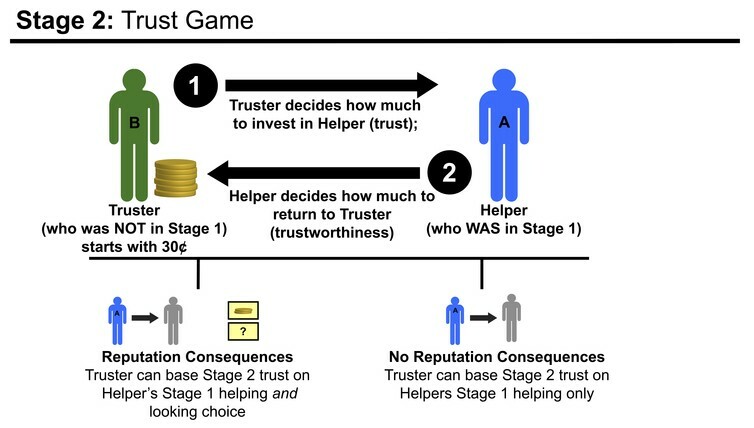 For half of participants, there were reputational consequences of calculating: The Truster was told whether the Helper looked at the cost before deciding whether to help – and thus Helpers could lose “trust points” by calculating. For the other half of participants, Trusters found out only whether Helpers helped, but not whether they looked at the cost. Our results showed that Helpers were less likely to look at the cost when they knew it would have reputational consequences. This result suggests that people do not make uncalculating decisions only because they cannot be bothered to put in the effort to calculate. Whether this strategy is conscious or not, uncalculating decisions can also be a way to signal to others that you can be trusted. Our studies demonstrate that there are reputation benefits to seeming principled and uncalculating. This conclusion likely applies broadly to social relationships with friends, colleagues, neighbors and lovers. For example, it may shed light on why a good friend is someone who helps you out, no questions asked – and not someone who carefully tracks favors and remembers exactly how much you owe. It may also reveal an unexpected reason for the popularity of rigid ethical guidelines in philosophical and religious traditions. Committing to standards like the golden rule can make you more popular. To trust Trump or Clinton? Our studies may also help to shed light on Trump’s appeal. One of his greatest advantages appears to be the authenticity that he conveys with his emotionally charged behavior. But it’s important to understand uncalculated decisions will benefit your reputation only if the actions you end up taking are perceived positively. In our experiments, Helpers who decided not to help without calculating the costs seemed especially untrustworthy – presumably because they seemed committed to be selfish no matter what. Similarly, Trump’s impulsiveness may be a plus for those people who support his values, but a huge turnoff to those who do not. In contrast, Clinton’s persona is often unattractive even to those who support her values – because it suggests that she may not stand by those values when the cost is too high. This may shed light on why she does not inspire more enthusiasm among some liberals, despite her experience and progressive record. However, there’s an important nuance to what it means to be “calculating.” One sense of “calculating” is self-interested: Before you agree to adhere to your ethical principles, or to sacrifice for others, you consider the costs and benefits to yourself – and you follow through with doing the “right” thing only if you conclude that it will be best for you. Another way to be “calculating” is to carefully consider what’s right for others. Instead of acting on her gut, a policymaker could conduct a complex analysis to figure out the best way to implement a policy to maximize its benefit to the population. Our theory and experiments apply only to the first sense of “calculating”: They suggest that engaging in self-interested calculations is what undermines trust. But in what sense is Trump uncalculating – and in what sense is Clinton calculating? Of course, there’s room for debate, but a common argument in support of Clinton is that her calculations reflect her ability to effectively play the game to deliver the most progressive policies possible, given the constraints of our two-party system. To win, Clinton needs to convince voters that her calculations have their best interests at heart – a major goal of this week’s Democratic National Convention.